When My Feet Go Through the Door: Groves and Withnall's? 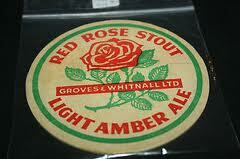 Groves and Whitnall's was one of Manchester biggest breweries in the 1950's before being taken over by Greenall Whitley and closed in the early 1970's. I'm not sure where it was exactly although I've seen the building (now converted into flats I think) a few times on the short train ride from Manchester Victoria to Eccles. A bit of a Googling suggests it was near the junction of Regent Road and Ordsall Lane on the banks of the Irwell in Salford but I can't see it on Street View. The Coronation Street brewery Newton and Ridley is apparently based on Groves and Whitnall's which the show's scriptwriters would have been able to see from their offices at Granada TV.